To most people, ghosts are the stuff of horror stories and nightmares. But to Yoh Asakura, a transfer student at Shinra Private Junior High, they're his friends! Yoh Asakura is a shaman--one of the gifted few who can speak to spirits. by channeling ghosts into his body--like the long-dead samurai Amidamaru--he can allow them to possess him and use their powers. But a modern-day shaman faces great responsibilities, because spirits--and the people who work with them--can be very dangerous indeed. Unconventional author/artist Hiroyuki Takei began his career by winning the Osamu Tezuka Cultural Prize (named after the famous artist of the same name). After working as an assistant to famed artist Nobuhiro Watsuki, Takei debuted in Weekly Shonen Jump in 1997 with Butsu Zone, an action series based on Buddhist mythology. 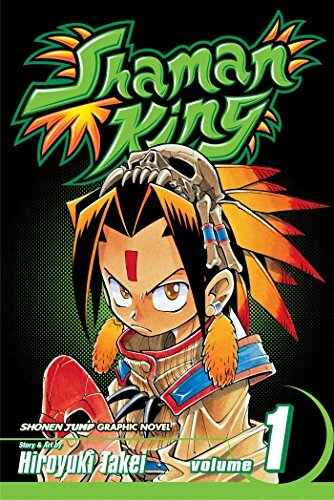 His multicultural adventure manga Shaman King, which debuted in 1998, became a hit and was adapted into an anime TV series. His new series Ultimo (Karakuri DÃ´ji Ultimo) is currently being serialized in the U.S. in SHONEN JUMP. Takei lists Osamu Tezuka, American comics and robot anime among his many influences.